(f) When overtime work is necessary to avail of favorable weather or environmental conditions where performance or quality of work is dependent thereon. In cases not falling within any of these enumerated in this Section, no employee may be made to work beyond eight hours a day against his will. (b) All hospitals and clinics with a bed capacity of at least one hundred (100), irrespective of the size of the population of the city or municipality where they may be situated. SECTION 2. Hospitals or clinics within the meaning of this Rule. — The terms “hospitals” and “clinics” as used in this Rule shall mean a place devoted primarily to the maintenance and operation of facilities for the diagnosis, treatment and care of individuals suffering from illness, disease, injury, or deformity, or in need of obstetrical or other medical and nursing care. Either term shall also be construed as any institution, building, or place where there are installed beds, or cribs, or bassinets for twenty-four (24) hours use or longer by patients in the treatment of disease, injuries, deformities, or abnormal physical and mental states, maternity cases or sanitorial care; or infirmaries, nurseries, dispensaries, and such other similar names by which they may be designated. SECTION 3. Determination of bed capacity and population. — (a) For purposes of determining the applicability of this Rule, the actual bed capacity of the hospital or clinic at the time of such determination shall be considered, regardless of the actual or bed occupancy. The bed capacity of hospital or clinic as determined by the Bureau of Medical Services pursuant to Republic Act No. 4226, otherwise known as the Hospital Licensure Act, shall prima facie be considered as the actual bed capacity of such hospital or clinic. (b) The size of the population of the city or municipality shall be determined from the latest official census issued by the Bureau of the Census and Statistics. SECTION 4. Personnel covered by this Rule. — This Rule applies to all persons employed by any private or public hospital or clinic mentioned in Section 1 hereof, and shall include, but not limited to, resident physicians, nurses, nutritionists, dieticians, pharmacists, social workers, laboratory technicians paramedical technicians, psychologists, midwives, and attendants. SECTION 5. Regular working hours. — The regular working hours of any person covered by this Rule shall not be more than eight (8) hours in any one day nor more than forty (40) hours in any one week. For purposes of this Rule a “day” shall mean a work day of twenty-four (24) consecutive hours beginning at the same time each calendar year. A “week” shall mean the work of 168 consecutive hours, or seven consecutive 24-hour work days, beginning at the same hour and on the same calendar day each calendar week. SECTION 6. Regular working days. — The regular working days of covered employees shall not be more than five days in a work week. The work week may begin at any hour and on any day, including Saturday or Sunday, designated by the employer. Employers are not precluded from changing the time at which the work day or work week begins, provided that the change is not intended to evade the requirements of this Rule. SECTION 7. Overtime work. — Where the exigencies of the service so require as determined by the employer, any employee covered by this Rule may be scheduled to work for more than five (5) days or forty (40) hours a week, provided that the employee is paid for the overtime work an additional compensation equivalent to his regular wage plus at least thirty percent (30%) thereof, subject to the provisions of this Book on the payment of additional compensation for work performed on special and regular holidays and on rest days. SECTION 8. Hours worked. — In determining the compensable hours of work of hospital and clinic personnel covered by this Rule, the pertinent provisions of Rule 1 of this Book shall apply. SECTION 9. Additional compensation. — Hospital and clinic personnel covered by this Rule, with the exception of those employed by the Government, shall be entitled to an additional compensation for work performed on regular and special holidays and rest days as provided in this Book. Such employees shall also be entitled to overtime pay for services rendered in excess of forty hours a week, or in excess of eight hours a day, whichever will yield the higher additional compensation to the employee in the work week. SECTION 10. Relation to Rule I. — All provisions of Rule I of this Book which are not inconsistent with this Rule shall be deemed applicable to hospital and clinic personnel. So the general rule is you can’t compel an employee to render overtime work except under the circumstances mentioned in Sec. 10 of Rule 1 of Book III of the Omnibus Rules. The rule is different with respect to hospital or clinic personnel. Under Sec. 7 of the above-mentioned Rule I-A these personnel may be scheduled to work overtime when the exigencies of the service so require. What these exigencies are is left to the determination of the employer. What is debatable is whether Rule I-A covers school clinics. I am not so sure it does. Why, my heart is truly hell! Give the victory at last! Save me from this sinful mass. If Thy Spirit strengthen us. Hard to learn, but learn I must. Do Thou pardon – Thou the Just. Here’s a great site on Reformation theology just full of articles and resources on the subject. To my students in Historical Theology – enjoy! I recently bought Amy Grant’s Legacy, a collection of hymns set to modern arrangement. I have always loved the old hymns and I think the arrangements on this CD are a pleasing treat. You’ll understand what I mean when you listen to it. The music’s neither rocky nor stale but refreshingly something you can’t point your finger exactly to: is it celtic, country, pop? Copies are obtainable at “House of Praise” (which can usually be found in any Robinsons, SM and Gaisano Mall) or at Phlippine Christian Bookstore. Highly recommended! 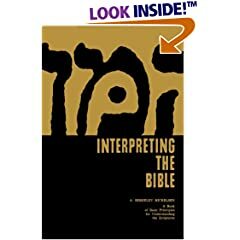 Mickelsen’s Interpreting the Bible came in today. I bought it for only around 700 pesos. Amazon’s selling it for around $ 35.00 so I think I made a good buy. 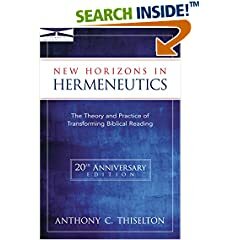 A couple of weeks ago or so I also bought Thiselton’s New Horizons in Hermeneutics for only around 1000 pesos. This message is meant to encourage Christians who are discouraged by their sins and their consequences – Christians who are ready to faint, as Hebrews 12 puts it, because of the divine discipline they are undergoing. An alternative outline: (1) the Person; (2) the Problem; (3) the Prescription. I. THE CHARACTER OF A CHILD OF LIGHT . A. He fears the Lord. B. He obeys the voice of Jesus (cf. Rom. 1:5). COMMENT: This does not describe the children of disobedience (Rom. 8:7; Eph. 2:1-3). We are now children of light because God has changed us (II Cor. 5:17; Jer. 32:40; Ezek. 36:25-27). II. THE CONDITION A CHILD OF LIGHT SOMETIMES FINDS HIMSELF IN. A. He sometimes walks in darkness: discouragement under discipline for sin. B. He has no light, no comfort or assurance of God’s favor. COMMENT: (1) It is still possible for a Christian to sin (1 John 1:8, 10; Rom. 7:22-25). (2) God will discipline his children when they sin (2 Sam. 7:14). III. THE CURE FOR A CHILD OF LIGHT WHO IS WALKING IN DARKNESS (Ps. 30:5; Lam. 3: 32; Micah 7:8-9). I read somewhere (on another blog) that when Billy Graham was asked, “What is the best Bible translation?” he answered, “The one you read.” Good answer! I’m presently using the English Standard Version. I grew up reading the KJV; later on I used the NKJV; then the NIV. Many of the verses I memorized, however, are from the KJV. I like the smooth, contemporary English of the NIV, but I miss the traditional theological terms I grew up with such as “propitiation”, which the NIV translates as “atoning sacrifice” in 1 John 2:2, for example. The NKJV, on the other hand, “eliminated the best feature of the KJV (its marvelous expression of the English language) and kept the worst (its flawed text),” according to Fee and Stuart in their book How to Read the Bible for All its Worth (p. 40 in the 3rd edition). The NASB, as many have observed, sticks too closely to the form of the Greek, resulting in wooden and stilted English. The ESV reminds me of the NKJV but with the advantage of a better textual basis. John Piper’s article on the ESV also influenced me in making the change. Those who would like to explore the possibility of using the ESV as their main Bible translation might also want to read what Leland Ryken has to say in his book, The Word of God in English. As far as the issue of gender-neutral translations is concerned I don’t think we Filipinos will be bothered much by it. We have the gender-neutral third person pronoun “siya” which is used in referring to both men and women, whereas English only has “he” and “she”. English for us is just our second language although many of us prefer to use an English translation of the Bible because most of us are trained to read, write and speak in English in school. At any rate, it seems to me that politically correct English is not yet the “in” thing here in the Philippines. The ESV I think is as good as you can get. On the negative side, however, some might find the ESV’s English a bit outdated with its O’s (e.g., “O Lord”) and archaic constructions (e.g., “Rejoice not”). In that case you might want to use the Holman Christian Standard Bible instead. Here’s a book I heartily recommend. I read it way back in college and I found it inspiring. It was the first book on Martin Luther I ever read and I really learned a lot in terms of church history and theology. Now, many years after, I teach Historical Theology in seminary and I guess my having read this book many years ago has something to do with it. Last Sunday I preached on 1 Cor. 13. Here’s the outline. Introduction: Who is the greatest? Luke 22:24. This is a question that Christians, whatever the motive, frequently ask. And it seems that in the church at Corinth during Paul’s time it was being asked but not with pure motives. The motives seemed to be pride and envy. People were proud of their spiritual gifts or envied those who were more gifted than they were. There was also division and discrimination. The question is timely because these problems can also be found in today’s churches. I. Four Kinds of Gifted People Who Could Lay Claim to Being the Greatest. The great speaker is able to captivate audiences and to sway them where he pleases. He can make them laugh, cry, change their mind, etc. But when our unloving lives contradict our fine speech our words no longer convince. They become mere noise: just like a resounding gong, a clanging cymbal – empty praise. Our tongues, just like these instruments were meant to praise God (Ps. 150:5) but the sounds they produce are mere noise in God’s ears without love (James 3:9, 10). Impressive speech and wonderful oratory is not everything, definitely not the main thing in preaching (I Cor. 1:17; 2:1, 4, 5). These are the people who impress us with their intelligence, their brilliance, their deep insights, their extensive knowledge and their academic credentials. And we are duly impressed! We often take this into account when choosing a guest speaker for special occasions in our churches or when enrolling in a subject in seminary. We want to know whether the teacher is academically qualified. There is nothing wrong with knowledge and academic credentials per se. In fact the Bible encourages to get all the knowledge and wisdom we can (Prov. 4: 7). The knowledge you have and share with others can bless people’s lives. Great and knowledgeable theologians like Luther and Calvin have been a great blessing to the church. The problem, however, is knowledge without love leads merely to pride (I Cor. 8:1). It can happen that the knowledgeable person is interested only in displaying his knowledge and not at all in the spiritual welfare of his listeners. He cares only about attracting attention to himself and not about leading them to God. In that case, he is truly nothing. Then we have the person gifted with great faith and daring optimism. He is not easily discouraged by difficulties. He dares to act against impossible odds. By his faith he is able to move mountains, so to speak (Mark 11:23). We owe a lot to this kind of people. They often inspire us to do what we would not ordinarily attempt without their prodding. They are often great leaders and organizers. By their faith and inspiration we are encouraged to go ahead with the church building project even though we do not know where the funds will come from. The problem however is it is possible to attempt all these great things without love – merely for self-aggrandizement or for the mere sake of getting things done and it turns out to be empty in the end (Ecc. 2:11). By way of contrast, Paul’s joy was not so much in his great accomplishments but in people whom he loved (I Thess 2:19, 20). This is something ministers should take to heart. The ministry is not about building an empire for ourselves; it’s about loving God and loving people. Finally we have the person who is willing to give up everything for the sake of the ministry. He is willing to give not only money but also his very life for the God’s work. These are the people who turn out to be missionaries, hard workers and self-sacrificing laborers in the church and in the mission field because they have a phenomenal capacity for self-sacrifice. Nevertheless, without love it is all for nothing. But why is this so? Is not giving and sacrifice proof of love? (c.f., John 3:16). Not necessarily. One can give all he has yet do so without love. This was the problem in the Church of Ephesus in Rev. 2 (see verses 3-5). They had great endurance. They were orthodox in doctrine. But they had lost their first love. It is significant that in spite of their endurance the Lord was willing to take away their lamp stand – to do away with their church – unless they repented. It’s just like a marriage relationship. There can come a time in a marriage when what used to be sincere expressions of affection become nothing more than dry routine. Yes, the external acts are still in place but something essential is missing. In the same way, you can faithfully go through all the motions of serving God – reading your Bible everyday, giving your tithes and offerings, attending Sunday School, prayer meeting and worship services, singing in the choir and witnessing – but if you do all these merely out of force of habit, merely out of a sense of duty, merely out of fear of your pastor and concern for your spiritual reputation, instead of out of genuine affection for God, would God be pleased? It’s not the number of flowers I give my wife on Valentine’s Day that counts, what counts is that she knows that I love her. II. So Who is the Greatest? Why? Because when we love we reflect God’s own character. Man was made in God’s image. God, however, is love (I John 4:8; John 3:16). Therefore when we love we are reflecting God’s character; we are shining forth God’s image. And when we do this we are glorifying God. So love is the greatest because love glorifies God who is the greatest. God, who is the greatest, is delighted to see his own character reflected in the lives of his children. The person who speaks well, who thinks brilliantly, who achieves great things and gives lavishly, but does so without love, ultimately cares only about himself. But he who loves cares about others and above all cares about God. The person who loves God as well as loves people who are actually created in the image of God glorifies and honors God as the One who is most valuable in the universe. Therefore love is the greatest because love glorifies God who is the greatest.